Welcome to the Zva Creative August Blog Hop! If you arrived here from Carole's Blog, you are in the right place, if not you might want to start at Zva Creative Facebook Page, so that you don't miss any of the designers beautiful creations. Hidden along the hop are FIVE Zva Creative prize packages, so it's important to leave a comment on as many blogs as you can along the way. Winners will be randomly chosen after the hop is over. 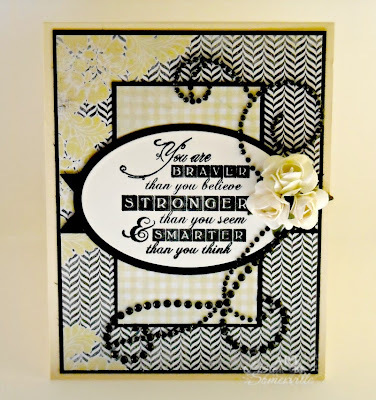 The sentiment is from the Artistic Outpost Typography plate, stamped in Black on Vanilla card stock, then die cut with Spellbinders Oval Dies and layered on a Black Oval. To embellish I added Zva Creative Mini Roses and a Jet Black Crystal Flourish (CRS-06CA-102). The Blog Hop runs through 11:59 EDT on Tuesday, August 27, 2013. Be sure to check back on Wednesday, August 28th, to see if you are one of the lucky Zva Creative Prize Package winners! The winners will be announced on the Zva Creative Facebook Page. Thanks so much for stopping by, your next stop is Nicole's Blog! Our Next DT Blog Hop will be on Monday, September 30th! Your card is so perfect, it almost looks like it is from a posh retailer! Just Gorgeous!!! Gorgeous card! I've always loved this quote by A. A. Milne! Thr Greenfield Wi store carries Zva products...asking them for more! Oh wow this is so elegant with such an inspirational sentiment. What a gorgeous and elegant card! The swirls really make it stand out. Such a chic, smart card, Lisa - it's super elegant! 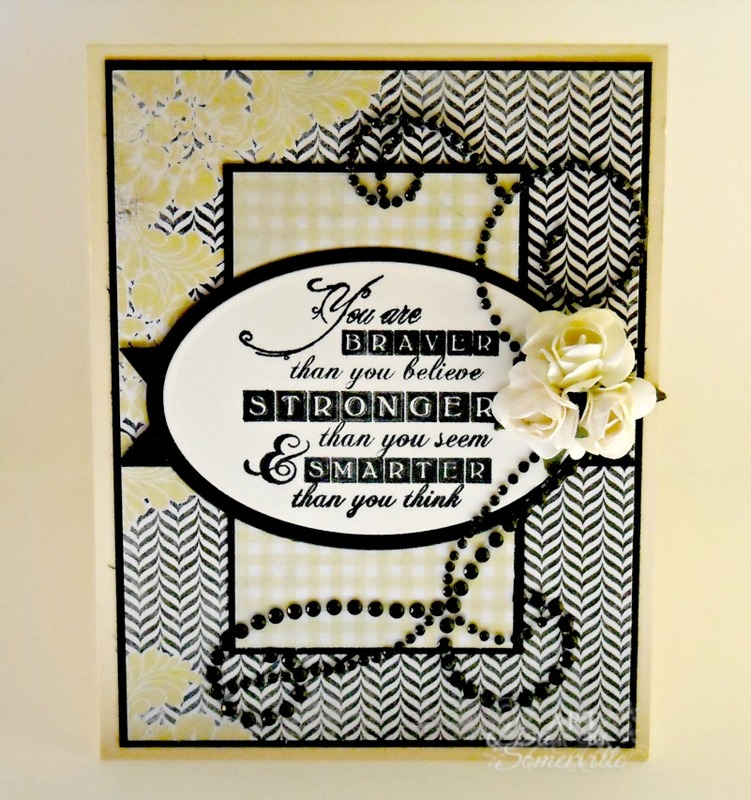 Love the swirls on your card! I dearly heart this card! The pearls just make it extra special! Gorgeous card! The sentiment on the stamp is beautiful and those mini flowers... so pretty! I really like the way you cut your chevron pattern paper and the flowers really pop! Wow! This is a Gorgeous card! I Love the sentiment,and the Zva Bling finishes it off,With Beautiful Zing... Have an awesome day! I have asked Michaels and Hobby Lobby to carry More Zva Creative! The vanilla and black colors are beautiful together. The black oval and gem swirls together with the lovely flowers makes a very elegant card. Beautiful job! Hi. Love the card and the sentiment is beautiful. Very Pretty - love the colors and the zva flourish is beautiful. Your card is gorgeous. Love the colors. Thanks for sharing and the chance to win. This card is so artistic I love the lay out of it!